Got Questions? We’re All Ears! As your trusted hearing specialists in Canada, Expert Hearing Solutions is pleased to provide answers for many common questions. We enjoy the patient education aspect of our job and hope we can help you make informed decisions about your hearing care. Please take a moment to review some of the questions and answers on this page. Do you need more information? Feel free to contact one of our locations or simply fill out our contact form. Select from the list below to read the answer. If you are entering one of our clinics for the first time, prepare to be in the appointment for 45 minutes to 1 hour. We start by asking you questions about your medical history and noise history to determine possible causes of hearing loss. The comprehensive audiological assessment usually takes about 20-30 minutes and then we sit down with you to explain the results. There is a wide range in costs, so there are a number of factors to consider: level of hearing loss, size/shape of ear canal, personal hearing needs/concerns and finances. Some hearing devices work better than others and so prices can range from $1000 each for the most advanced digital technology. There are 5 levels of technology that are available in any size. The assessment and consultation with your clinician will help determine the best hearing device for your needs. Getting accustomed to amplification can take time. Your ears and brain need to adapt to hearing differently. Once we know objectively how the hearing devices are working we will need to fine-tune them based on your daily routine and listening situations. Expert Hearing Solutions offers the longest trial period in the industry: 100-day, 100% money-back guarantee. Even though we cannot replace the natural hearing that was lost, many people with moderate hearing losses can actually hear better than normal hearing people in noisy situations due to the advancements in technology. The hearing devices are adjusted to fit your hearing loss precisely. They aren’t just amplifiers anymore. In fact, part of the computerized chip in the hearing device analyzes your listening environment as you’re wearing them. When we see you for follow-up appointments, we can tell, by hooking them up to the computer, how you are using them so we can make intelligent, fine-tuning decisions to optimize your hearing by connecting them to the computer. What are 'open-fit' or OTE style hearing devices? Open-fit hearing devices have dramatically changed the perception and acceptance of hearing devices. Not only are they very cosmetically appealing, they have significant benefits over traditional styles of hearing devices. They are the most comfortable devices to wear. Within a few hours, most people do not even feel them in their ears. They significantly reduce or eliminate what is called the occlusion effect (feeling like your head is in a barrel, your voice sounds like an echo chamber, and when you eat everything is very loud). Because the ear canal is kept open, we are not plugging the ear as traditional hearing devices do, and so the internal resonance of sound is dramatically reduced. Everything sounds natural, not mechanical, and not so harsh or boomy. The audiological assessment is very important in determining if these devices could be an option for you. If you have sufficient hearing loss in both ears it is best to wear two hearing devices. Over 90% of fittings today for patients are for both ears. 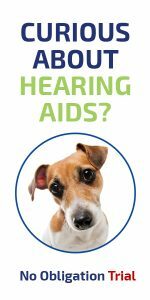 Our testing will help determine how much better you could hear with two ears versus one ear. The biggest reason patients don’t wear two hearing devices is because of cost. We are born with two ears for a reason. With our 100-day, 100% money back guarantee, start with two hearing devices and if you really feel that you can get by with one, you can still return the other device for your full money back. I have constant ringing in my ears. What is it & how can it be treated? The term is tinnitus (pronounced ti-ni-tus or ti-nigh-tus), and it means the perception of noise in the ears or head when no external noise is present. The most common causes of tinnitus are noise-induced hearing loss, head/neck trauma, adverse medicine reaction or allergy and autoimmune deficiency. Learn more about tinnitus. First of all, realize that there are NO hearing devices that completely get rid of background noise. Some noises need to be heard for safety reasons (i.e. a car zooming by as you start to walk across the street). No device is smart enough to distinguish between what you want to hear and don’t want to hear. Think of this in a restaurant or group setting. Even with normal hearing, we need to face the person we are talking to in order to hear them in noisy settings. Advanced sound processing in digital hearing devices are getting better all the time at recognizing the difference between speech-like sounds versus other sounds. Speech-like sounds are more enhanced so that there is improvement in clarity. The next phase in technology that will improve hearing in noise even further is Bluetooth® technology. See the question about how Bluetooth® can improve your hearing. What is Bluetooth® technology & is it available in hearing devices? Bluetooth® is a technology that allows two electronic devices to connect wirelessly. The current Bluetooth® technology available in hearing devices is meant for cell phone use. If you have a Bluetooth® compatible cell phone, you can connect to the Bluetooth® adapter in your hearing device and talk on your cell phone without ever taking the phone out of your pocket. The signal is received into your hearing device and a small microphone in the adapter picks up your voice as you talk. If your computer, television, DVD player or CD player is Bluetooth® compatible, then you could have a wireless connection right into your hearing device. The next phase in Bluetooth® technology is for improved hearing in noise. If you go to a restaurant or large group gathering with a friend, you give the person a small lapel mic that can clip to that person’s shirt/blouse so that your friend’s voice is transmitted wirelessly into your hearing device. Even people who hear normally will be able to benefit from this technology. FM technology has been available for years improving hearing in noise. However, Bluetooth® technology is a fraction of the cost. Consult with your local Expert Hearing Solutions clinician for details. Are there special listening devices available for the television or telephone? Definitely. TV listening devices are wireless and come in either infrared (like your TV remote) or FM (allows you to be anywhere in the house and listen). Amplified telephones have adjustable ringer tones, ringer volumes and built-in high frequency amplifiers to improve clarity. They also come in cordless options. There are also many assistive listening devices that people don’t even know about: amplified, vibrating or strobe light signal devices for alarm clocks, doorbells, watches and fire/security alarms. Consult with your local Expert Hearing Solutions office for more details. Should I get custom hearing protection for my noisy job or for running my lawnmower & grass trimmer? Having proper hearing protection is crucial for preserving your precious hearing. Noise-induced hearing loss is now the most common cause of hearing loss. The good news is 99% of noise-induced hearing loss is preventable. The bad news is very few people protect their ears. Once damage is done to the inner ear, it’s not reversible. A good rule of thumb is if you have to speak loudly with the person beside you to communicate because of noise, hearing protection should likely be worn. How long you can be exposed to a sound before permanent damage occurs depends upon the intensity of the sound. Expert Hearing Solutions makes custom noise protection, plus custom musician plugs, swim plugs, sleep plugs and iPod plugs. Creating awareness about the prevention of hearing loss is a very important part of our profession. Consult with your local Expert Hearing Solutions staff for more details. If you have other questions, please feel free to contact us by phone or email. Plus, we have provided many links to other helpful websites in our resources section. How can I prolong the battery life of my hearing aid? Opening the battery door when you remove your hearing aid for an extended length of time is one way. An 8th grade student in Rochester, NY has found an unusual way to save significant money on batteries recently. He found that once he took the sticker off a new battery, if he waited 5 minutes before putting it into the hearing aid, battery life improved by 80%. That means your battery could last 2 or 3 days longer! Here’s why. Taking the sticker off a new battery allows oxygen to combine with the zinc oxide in the battery. Oxygen energizes the zinc oxide, so allowing 5 minutes for the two to mix significant improvement of the battery life. Also, don’t keep your unused hearing aid batteries near metal objects, or they might short circuit. Avoid getting dirt on your new batteries by washing up before handling them, and DO NOT STORE BATTERIES IN THE REFRIGERATOR. This once-popular trick not only doesn’t work with today’s zinc oxide batteries, it actually has the opposite effect! Is hearing loss linked to dementia? People who lose their hearing are at an elevated risk of developing Alzheimer’s disease and other forms of dementia. Hearing loss could also be an early warning sign of dementia. In fact, 1/3 of dementia risk can be explained by hearing loss, though the connection is rarely considered. Many people ignore hearing loss because it’s such a slow and insidious process as we age. Get your hearing checked!! Something as simple as being fit with hearing aids might delay the onset of dementia. Avoid loud noise, and if that’s not possible, wear some type of ear protection. Avoid smoking, as smoking disrupts the blood flow to the inner ear, a significant contributor to hearing loss. If you already have hearing aids, have them checked regularly to ensure optimum function. Do we hear with our brains, and not our ears? Your ears act as messengers for your brain by receiving sounds and transferring them along the hearing branch of the VIIIth cranial nerve to the Auditory Cortex of your brain. The Auditory Cortex plays a key role in language comprehension and memory, and is an integral component of cognition. Reduced function of the Auditory Cortex has been linked to early stages of Alzheimer’s/dementia. Do you hear but have trouble understanding? Damaged hair cells may be the reason. Any sounds that are not picked up by your ears are also not sent to your brain. The cochlea contains both inner and outer hair cells, often referred to as “nerve endings.” These hair cells are responsible for sending information to the auditory cortex of your brain via the Vlllth cranial nerve. Once your hair cells become damaged, speech becomes unclear and you have more difficulty understanding speech, particularly in noisier situations. The hair cells of the cochlea cannot be repaired by medication or surgery. Today’s sophisticated digital hearing aids provide auditory stimulation and help restore speech clarity, which not only significantly improves your interaction with others, but may even contribute to delaying or preventing diseases like dementia.